The problems with Austin’s only rail transit line, the Red Line, are well documented and understood, even going so far as being used misleadingly by anti-transit activists to oppose light rail in general – even though the Red Line is not a light rail line, but a Diesel Multiple Unit (DMU) running on a freight rail line. Following the failure at the ballot box of a really good urban rail plan in 2000, Austin leaders sought to get something done by building a starter transit line with a relatively low initial capital cost based on an existing freight rail corridor, even though ridership was never expected to be very high. Ridership on the Red Line remains very low for a high quality transit investment. Three times as many people ride on the 801 MetroRapid today on South Congress, Guadalupe, and North Lamar, than ride on the Red Line. However, a large package of additional investments and substantial change to land use might still bring a future with a lot of people able to use the Red Line. Following the failure of the 2014 transit referendum, Capital Metro launched another attempt to create a vision for a regional network of high quality transit, using real data to focus on lines and stations that would provide the most possible people with access by high quality transit. 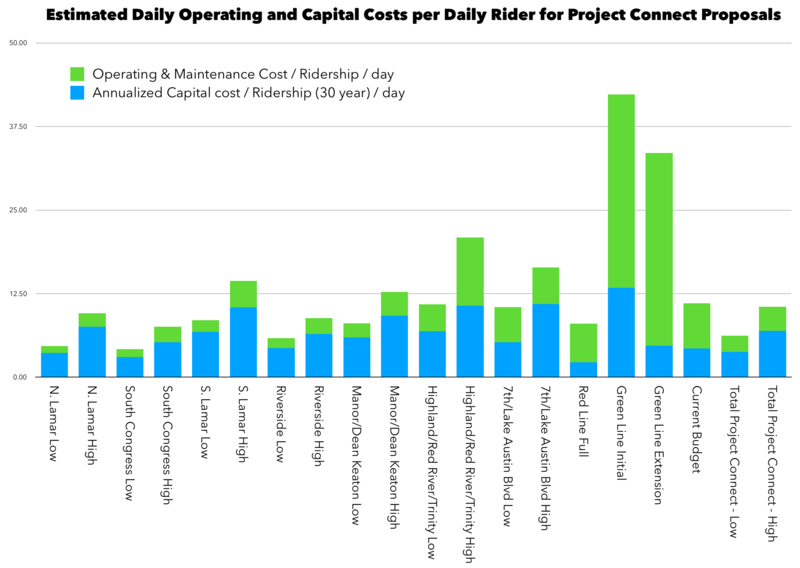 And now we have the data, which shows that the proposed Green line is the most expensive proposal included in the current draft Project Connect vision in terms of capital and operating / maintenance costs per daily rider. The published costs and expected ridership for the Green Line show that it is expected at this time to be similarly disappointing – and not very useful to very many people – as the Red Line is today. The Capital Metro Board will consider approving an Interlocal Agreement (ILA) with Travis County on Monday, July 30, according to the board packet, pages 42 – 59. Travis County Commissioners Court already approved the deal on July 10 with passage of a Travis County Transit Development Plan, which can be found on pages 347 – 422 of this agenda packet. Why does the Green Line seem like such a bad proposal? Capital Metro has published extensive research on the Project Connect website, which you can find through this link and clicking the “resources” tap at the top of the page, then the resulting “Project Background” tab in the middle of the page, and then clicking on “Phase 2” to see the most recent background files. The chart above comes from one of Capital Metro’s Project Connect reports that you can find here. Surface light rail along Guadalupe / Lamar is the most fiscally responsible of all proposed investments, coming in at a total of $4.65 a trip. The initial build out of the Green Line is the least fiscally responsible of all proposed investments, both in terms of capital cost per rider and operating and maintenance costs per rider. We won’t get very much bang for any public bucks invested in the Green Line – as it is proposed. There is a long history of segregation and systemic racism in Austin that includes a historic push for people of color to live on the east side and push for non-hispanic white people to live on the west side – although the Austin of today is more mixed with many people of color living across the city and many non-hispanic white people living on the east side. Looking at the data from Phase 1 of Project Connect, shows that the corridor along the green line has the highest percentage of people of color living within a 1/2 mile of the corridor, at 55% of all people living in that area. The common sense perception that investing in high quality transit on the east side is an equitable use of funds makes sense. But is this investment the right one? Measuring how many people live within a 1/2 mile of a corridor is not how transit works. What matters is people’s access to stations and whether they will actually be able to use the transit. A rail line going through your area doesn’t help you if there isn’t a station anywhere near you. 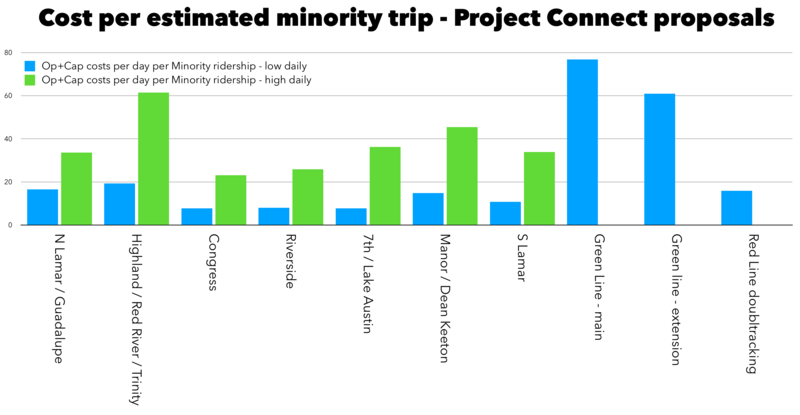 Using the ridership and cost estimates from Phase 2 of Project Connect, I estimated expected minority ridership on each Project Connect proposal and then established a cost per minority trip for all proposals. 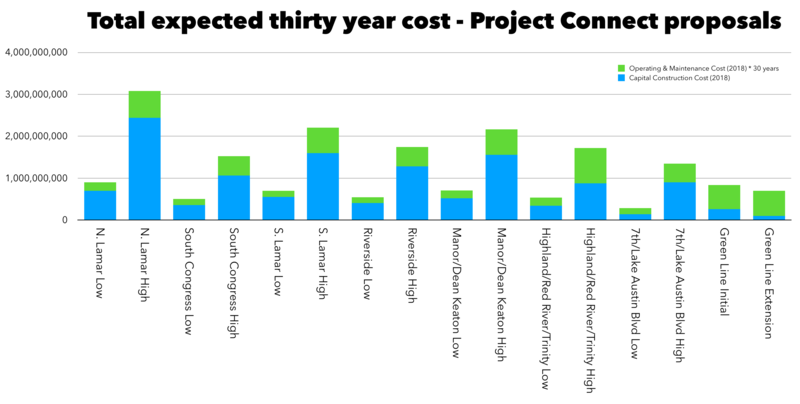 This chart shows this metric for the main proposals of the Project Connect, showing that the Green Line is the most expensive way to provide a person of color with a transit trip, of all the proposals put forward in Project Connect. According to these estimates, the initial Green line project would be used by only 991 people of color every day, while Guadalupe / Lamar (surface light rail lower-cost version) would be used by 4,965 people of color every day and the higher-cost elevated Guadalupe / Lamar light rail line would be used by and estimated 8,369 people of color every day. The Green Line is expected to serve the least people of color of all the proposals included in Project Connect. It’s important to note that the real problem with the Green Line is the very low projected ridership, not high cost to build the project. The actual capital costs are lower than most of the other lines proposed. But the expected ridership on the Green Line – as proposed – is ten percent of the expected ridership of the proposed Guadalupe Lamer surface light rail line. The very low expected ridership is a big part of what makes the cost per ride so high. Another important note is that the Green Line is expected to cost a lot more to operate than many of the other proposed lines, at almost three times the total cost to operate than the proposed Guadalupe Lamar surface light rail line. While the capital costs are expected to be the lowest of all lines – at an estimated $264 million for the initial Green Line – the operating costs are expected to be $630 million for thirty years of service, meaning that the question at hand is really an $834 million investment. Capital Metro is claiming these ridership estimates are all very conservative, so they hope all of them will actually end up higher. They were so burned in 2014 with many people saying their ridership estimates were overblown, that building support to transit investments starting from very conservative success estimates makes sense this time. There could be a world where you actually build walkable urban communities at all the stops along the Green Line, get to ten minute or less frequency, and add in a lot more stations along the green line to actually serve the many people of color who live near the line, but not near a proposed station, where the green line could really drive down those ratios. A future blog post will consider if it is possible for the Green Line to make sense from an equity and fiscally prudent point of view – by adding stations and changing urban form. Another future blog post will look at the question of whether it makes sense to add this kind of transit investment to serve low income people. The short answer is no, as the much talked about story of the suburbanization of poverty is largely not accurate with 85% of Travis County households living in poverty living inside the City of Austin. If we’re in a scarce transit funding scenario, it’s important we all understand that the Green Line – as proposed – is the least useful of the proposals on the table, costs the most, and would serve the least people of color. However, there may actually be two good projects that could serve people of color and bring the equity we want in Project Connect. Over a year ago, we studied and advocated for two possible high capacity lines to be brought back into Phase 2 of Project Connect, Oltorf and Pleasant Valley. After the Capital Metro board agreed with our proposal and brought them back into the process, staff determined that these two proposed lines would be studied as future potential corridors, so we still do not have the same ridership and cost estimates for serious high capacity transit lines there. Travis County should include Oltorf and Pleasant Valley in the study they plan to do – if they are concerned with equity, fiscal responsibility, and providing as many Travis County residents – and people of color – as possible with better transit access.